The Witcher 2 Version 2.0 will be released at the end of September, a free upgrade that will add a new tutorial, difficulty level, "Arena Mode" and more. CD Projekt revealed today at Gamescom that The Witcher 2: Assassins of Kings will be given a major facelift in September with the release of The Witcher 2 Version 2.0. Along with a raft of technical enhancements, the overhauled game will include a new tutorial system that will ease players into the game rather than dropping them on it face-first from 20 feet up, an "Arena Mode" that sets players against successive waves of increasingly difficult enemies and a new difficulty setting, "Dark Mode," described as almost as challenging as "Insane Mode" but with game saving allowed. "Dark Mode" will also add a series of powerful new "dark" items to the game and alter the campaign in unknown ways. This isn't the first time CD Projekt has done such a thing, as you may recall. 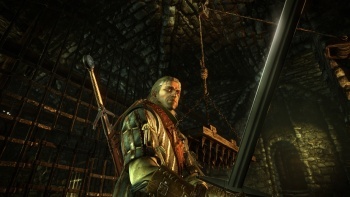 The original Witcher got the same treatment with the 2008 release of The Witcher Enhanced Edition, which featured dramatically improved dialogs, better stability, numerous bug fixes and a couple of new quests. The Witcher Enhanced Edition was offered as a free download to all existing Witcher owners and the Version 2.0 upgrade of The Witcher 2 will be as well. CD Projekt also announced that the Xbox 360 version of the game will include all the Version 2.0 enhancements, plus all DLC releases. The Witcher 2 Version 2.0 comes out on September 29, while the Xbox 360 edition of the game is slated for release in early 2012.